Houston author Tera Stidum once again went national this week as she appeared this time on Steve Harvey's syndicated daytime talk show (weekdays at 3pm on FOX 26 KRIV). The online dating expert's mission is to help singles get it right in their dating lives. "My appearance on Steve was me helping two singles, a woman and a man, with dating profile overhauls," Stidum told mikemcguff.com. "Dating profiles are the 'resumes' of the online dating world and most people strike out when it comes to their profiles - bad pictures, terribly written profiles, which don’t share the essence of who they are, or what they are looking for! I helped these two people by giving them newly written profiles, and selected better pics for them as well." How did Stidum become an expert? Through experience. The former talk show producer didn't have time to meet someone and tried online dating. It worked and she met her husband. In effort to help her friends and others drop the fear of meeting dates through the Internet, Stidum opened a coaching and workshop business, She Dates Savvy, LLC. 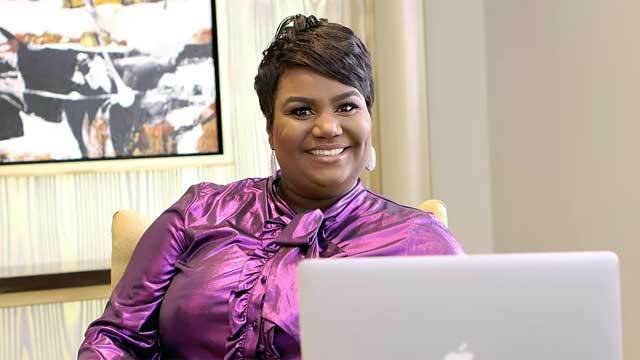 Knowing lots of people in the television talk show biz, Stidum began being interviewed as an expert in places like TD Jakes, OWN’s The Book of John Gray, The Raw Word, the Houston Chronicle and radio. Through teaching, Stidum shared her story of leaving a Dr. Phil producer job, breaking off a relationship and coming back home to Houston for a new beginning. Stidum's father always said write a book, so she took his advice with Smart Girls Don’t Date Dumb. Part autobiographical, part dating tips and advice, the book shares wisdom the now dating guru gained from her own mistakes. "What I know for sure is we get in our own way when it comes to getting the goodness life and love has to offer us," Stidum told me. "If I can share my story as a way to help inspire others, they too can find love, it’s well worth it. There is a chapter in the book from my husband called, 'Kings and Kids,' where he gives ladies the skinny on men! A lot of women will never get the benefit of hearing the truth from a man who wants nothing from them, but this chapter does just that. Women eat it up and I’m HAPPY to share his wisdom with them." If you want to learn about the best online dating sites, sending messages, weeding out romance scammers, crazies and freaks, as well as getting to the date, then check out Stidum's upcoming webinar The Smart Girl’s Guide to Digital Dating 2.0 being held March 3, 2019.